As I was designing this card, I was aiming for a zen, spa-like feel in the layout and colors. I used my new Unity stamps, though I don't know why I got this set because it is very similar to SU's Stem Silhouettes! Oh, and yes, the bamboo branch is upside down, I just realized that. Oops! It was yummy! 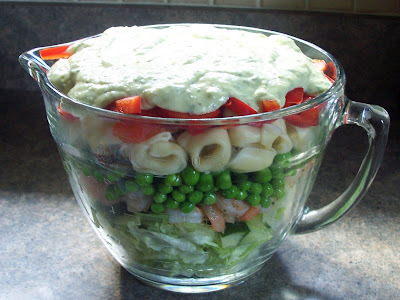 Layers of lettuce, cucumber, grilled shrimp, peas, cheese tortellini, red pepper, topped with a dressing of pesto, mayo, and buttermilk. The perfect summer dinner! Great card Becky! I kinda like the bamboo upside down =). I love the soft colors and the simplicity of this one. TFS! Super cute!! I love the clean spa like look. Dinner looks yummy too!! Super card, I didn't notice thew bamboo until i read the post:) yummy dinner, looks so pretty too!! pretty card!! fits the sentiment perfectly.. simply wonderful! can I come next time you make this for dinner? looks so good. I think you nailed the Zen feeling of the card, very soft and quiet. Looks like a Pampered Chef Classic Batter Bowl. I pay way too much attention to detail. Great card and scrumptous dinner! Nice card Becky - great looking dinner too. 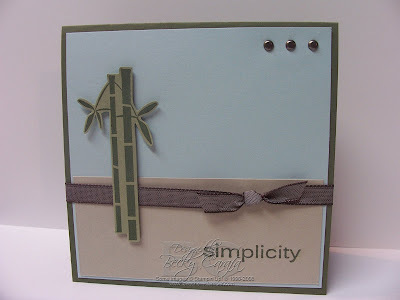 Love your card even with the upside down bamboo!! LOL! I got this set, too, but haven't used it yet! Could you post the dressing recipe for this yummy dinner or e-mail me...when you have the time!! yes, could we have the recipe? This looks so good!